Turning what was once waste and undesirable material into something brand new and even better than before is not an easy process. It requires a lot of time, specialized machinery and a knowledge of how to effectively transform old into new once again. While the process is complex, the benefits to our society, economy and most importantly–our environment are immense and well worth the effort. City Recyclers specializes in recycling many different kinds of plastic materials. 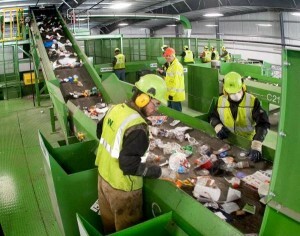 A full description of the type of plastics we recycle can be found here. The first step in recycling plastic is to get everything sorted out. It’s critical to sort and categorize materials according to their resin type because if a batch is contaminated it can become un-reusable. As mentioned on our page discussing the different kinds of plastics we recycle, the materials are sorted out and removed from one another using sensors, ejectors and human input to carefully place them in the correct area to ensure there is no contamination. The next step in the process after the various plastics have been sorted is to reduce size through heat and pressure. A pressurizing machine pull the plastics thorugh a screen which places pressure which can exceed 5,000 PSI. This process also helps to remove any contaminants in the melt. An enormous amount of heat is also generated during this process which helps to melt and compress the various sizes and shapes into a single mold of plastic which can be processed much easier. After the plastic has been put into more manageable sizes and shapes, the stock usually needs to be washed in order to remove lingering dirt or attachments. Paper, glue, sand and grit are some of the common elements targeted in the washing process, which can be accomplished using water baths, friction washers, or a washing line. The washing line supplies a continuous hot spray over a stream of plastic material, removing some or all of the labels and dirt attached to the plastic surface. Detergents and disinfecting agents are often included in this process to improve the level of cleaning. The final step for most plastic recycling is to pelletize. Converting post-consumer plastic into pellets allows for easier distribution and remanufacturing, and ultimately benefits the speed and effectiveness of reintroducing recycled plastic into industrial manufacturing. 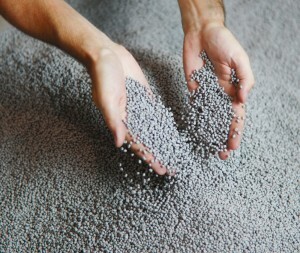 At the end of this process, the plastic is ready to be extruded into smaller, manageable pellets. 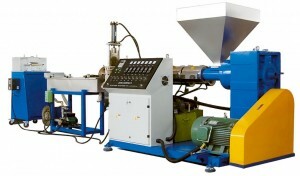 Typically, single or double screw extruders are used at this stage. The ratio between the length of the extruder screw and its diameter, as well overall screw design, can vary depending on the type of resin being processed. Single screw extruders rely on pumping action and shear to shape plastic, while double screw extruders perform more of a mixing function with lower shearing force to create a compound material. Ventilation and vacuum pumps may be required to regulate the degassing effects. Once the reclaimed plastic has been pelletized, it is ready for distribution and remanufacturing.